How participants in the Milwaukee Avenue Corridor Development Initiative workshops responded to a question about parking also surprised organizers of the workshops (in a good way) (also see Height and Milwaukee Avenue [Part I]), and a few participants as well (in a not so good way). How do you feel about parking on Milwaukee Avenue? Sixty-six percent of workshop participants felt that there is sufficient or too much parking on Milwaukee Avenue, and only 34% felt that more parking is needed. I think workshop participants got this answer right, and the response is consistent with the results of the polls I posted at Do we need more parking? (click on image below for better legibility). As I write this, 80% of respondents believe that the amount of parking on Milwaukee Avenue between Logan Boulevard south to California Avenue is just right or too much, while only 19% believe that there is not enough parking. I broke the poll up into two distinct, but relatively equal in distance sections of Milwaukee Avenue encompassing all that was under consideration during the workshops, thinking that there might be a difference in the perception of need based on where on Milwaukee Avenue you were looking. 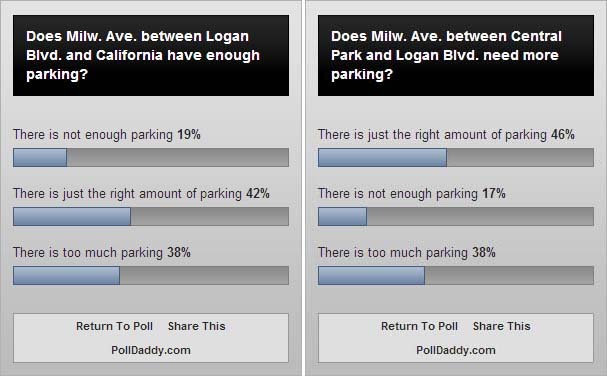 However, 84% of respondents also believe that the amount of parking on Milwaukee Avenue between Logan Boulevard north to Central Park Avenue is just right or too much, while only 17% believe that there is not enough parking in that stretch (n.b: due to random polling, the order of the responses in the two polls is not parallel in the image above). Both the workshop response and the poll responses are consistent with my own findings regarding the limited stretch of Milwaukee Avenue that is the focus of this blog, between Logan Boulevard north to Diversey Avenue, as previously expressed in Is there a parking problem? and Parking: a game of musical chairs. This entry was posted on Saturday, October 17th, 2009 at 12:49 pm and is filed under Development options, Logan Square, Milwaukee Ave..	You can follow any responses to this entry through the RSS 2.0 feed. You can leave a response, or trackback from your own site.